[Vincent Nichols] is expected to be the highest- profile Catholic archbishop so far, as he continues his broadcasting and writing work while speaking out on issues such as education, health, immigration, gay adoption and the need for a renewed sense of morality in financial markets. Archbishop Nichols, who typically speaks from a conservative Catholic but politically left-wing standpoint on such issues, is expected to champion faith schools in particular. He will oppose the growing secularisation of society and challenge Government policy when he believes that it is going against Catholic principles. He will also have difficulty uniting a flock divided by conflicting factions, from liberals who want to abandon traditional teachings to conservatives who want a weekly Latin Mass and the reversal of the Second Vatican Council’s innovations. One of the few criticisms levelled against him has been that he might be ambitious, but he has always insisted that his ambition is for God and not for himself. He denied that he was disappointed when he did not get the Westminster job in 2000. “I was too young, I didn’t expect that then, and it was just speculation,” he said. His ascent to the most senior archi-episcopate in England and Wales marks a change in tone for English Catholicism. The restoration of the hierarchy in 1850 marked the beginning of the end of the worst anti-Catholic discrimination. Even now, heirs to the throne cannot marry a Catholic without forfeiting their right to succeed. Apart from occasionally calling for the reconversion of England, bishops and archbishops have been careful to keep a low profile for fear of reawakening anti-Catholic prejudices. Only last week, Cardinal Cormac Murphy-O’Connor, who is now the “apostolic administrator” of Westminster until Archbishop Nichols is installed, said that he was in no hurry to see the Act of Settlement of 1701 repealed. Archbishop Nichols, representing a younger generation of priests, has no such fears. “Sometimes voices that are opposed to religious faith are raised more stridently in London,” he said. In its lead editorial for Saturday's edition, the paper cites the hope that Nichols "will not shrink from the challenge of asserting Catholicism’s place in national public life." 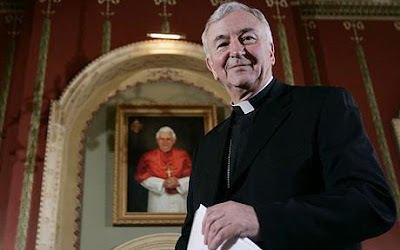 Archbishop Nichols, 63, urged Catholics to unite behind him, but delivered an uncompromising message to his detractors. "I'm not here to make friends with people," he said. "I will do what I believe is right. "Our task is to be faithful, not successful. The judgement that bothers me is the judgement of God." There had been opposition to the appointment of Archbishop Nichols from some leading figures in the Catholic Church, but he argued that he is confident that people "will pull behind him". "The bishop is the focus of unity. It's not a question of whether people like me or not. I'm prepared to be unpopular for God. "I think the Catholic instinct for unity is more than a superficial thing. It's a deep and committed thing." The archbishop's outspoken championing of Catholic causes over recent years is understood to have impressed the Pope, who chose the Liverpool-born archbishop after months of speculation over who would succeed Cardinal Murphy-O'Connor. At a meeting at Archbishop's House in Westminster, he made clear that he will not flinch from ensuring that the church is open to challenging "new frontiers". In 2003 he successfully forced the BBC to withdraw Popetown, a cartoon that satirised the Vatican, and won his battle with the Government in forcing Alan Johnson, then education secretary to back down over proposals to make faith schools take up to 25 per cent of pupils from other religions. He said: "There are all sorts of frontiers that we must be courageous in facing, for example, today anyone who is going to support a life of faith has to have a real depth of personal faith and we have to do what we can to help give people the opportunity, personally, individually, to grow in faith. "Real social, community cohesion will not be achieved on an aggressively secular model. "I think if we, as it were, banish that depth of humanity which is inspired by faith, then our public services become commercialised, purely and simply." ...and, in its profile, notes one of the archbishop's earlier boyhood ambitions: being a truck driver.